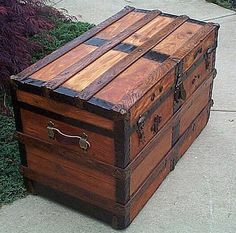 My father had given me an antique sailor's trunk, with the year 1911 carved into it, to use as a toy box. I had it in my room and it was pretty packed with Lincoln Logs, model train pieces, stuffed animals, and the like. And somehow got the idea to empty out the box and get into it, myself. It was barely big enough, but if I bent my knees under my chest, I could fit. Of course, I had to try this with the lid shut. Now, I knew the lid had a latch for a padlock that would drop down if the lid were lowered abruptly, so I tried to lower it as softly as possible. And the latch stayed safely in place…until I tried to open the lid. Then it snapped down, and I was locked in the trunk. Well, don't think I didn't scream…and Mom could hear me…but she thought I was still acting up from dinner, and refused to come. Eventually she did, of course, and still thinking I was acting up, not understanding that I was screaming because of being locked in the trunk. She went to her grave unable to remember the incident at all!